Chief Neil Dubord talks about his first year as Delta's top cop and what makes the department - and the community - different. Delta Police Chief Neil Dubord. Policing in Delta is all about building relationships, says Chief Neil Dubord. He sat down with the Reporter on Wednesday, Aug. 24 to reflect on his first year on the job as Delta’s chief constable. He took over in June 2015 from longtime and well-respected chief Jim Cessford. He is very enthusiastic about his new position and the Delta Police Department in general. Its policy of “no call too small” enables it to deal with crime and disorder quickly, but it also allows police officers to build relationships with residents. Dubord says that about 25 per cent of calls to police are crime-related, while the remaining 75 per cent are due to disorder. Sometimes, these small calls also begin to uncover significant criminal activity. Referring to the DPD’s no call too small policy, Dubord said Surrey criminals know better that to come to North Delta. He credits Delta council with a willingness to staff the police department so that it can respond to small calls, and says the public is very satisfied with that level of service. Other ways that Delta Police build relationships is by being recognizable members of the community. School liaison officer Const. Sean Doolan grew up in Delta and knows parents and grandparents of many of the students he interacts with. Last year, he proactively called a number of people he knew to let them know about the “Hell Night” that has often accompanied the start of school in Delta. As a result, many families intervened to keep their childrenaway from events, reducing the potential for trouble. 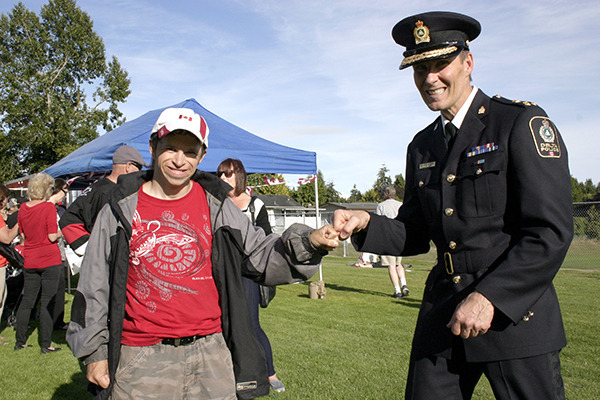 Delta Police Chief Neil Dubord greets his “good buddy” Richard MacNaughton at the 2016 Canada Day celebration at North Delta’s Chalmers Park. “I live here and I have a stake here as well,” Dubord says of Delta. Delta Police officers are “Deltanized” even before they are hired, Dubord says. Most start off as volunteers in community police offices, and become familiar with the community and how police respond to calls. A good number of them are already Delta residents. Those who are interested in going further with police work then become reserve constables, with about 25 per year being trained. As reserve officers, they get to know the community better by working at community events such as Tour de Delta, North Delta Family Days or Sunfest. About 65 per cent go on to policing careers – many with the DPD, but also with other municipal forces such as Vancouver, New Westminster or Abbotsford. Dubord emphasizes that there is a difference in the way a local police force and a national police force such as the RCMP does police work in a community. The DPD is overseen by a local police board, made up of members of the community. Policy is set at the local level, and most Delta Police officers spend the lion’s share of their career here. RCMP members are part of a large national force that sets policy for the whole country from Ottawa. They often transfer from detachment to detachment, or specialized unit, many times during their career, and numerous moves are not uncommon. “The transition and the fluidity often means they do not have a chance to connect into a community and build relationships,“ Dubord says. That’s not just a casual observation. Recently-hired Deputy Chief Norm Lipinski, whom Dubord worked with in Edmonton (Dubord was with Edmonton Police for 25 years before becoming TransLink Police chief in 2012), had spent five years with the RCMP before coming to Delta and observed these differences firsthand. 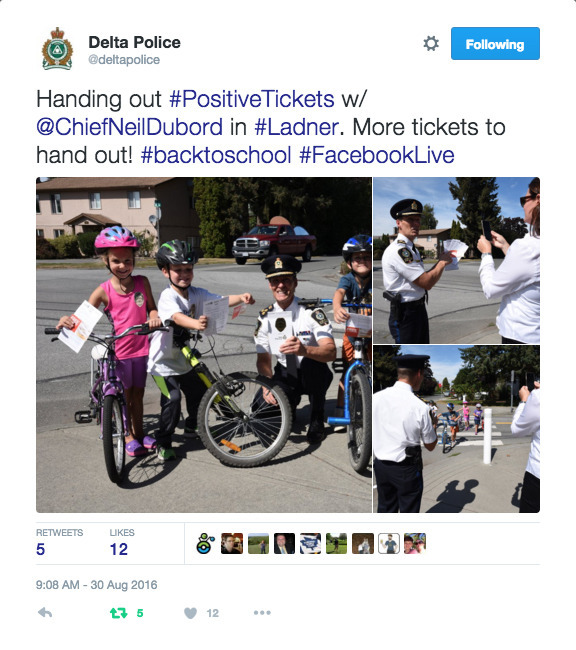 Dubord made three promises when he took over as chief: to continue the “no call too small” approach, to ensure Delta Police is a strong community-based organization and to advocate for Delta in partnerships and relationships with other levels of government, policing agencies and the community in general. Dubord wants an operational review of how the department conducts community policing “so we can go from good to great,” adding service is very important. “People expect to be treated with respect, for us to be courteous and prompt,” he says. Policing in North Delta is somewhat different than in other areas of Delta. Dubord says “you can’t assume the same approach” when policing in the various areas of Delta and on the Tsawwassen First Nation, where DPD has a policing contract. “North Delta concerns are different,” he says. “Traffic, property crime and a considerable amount of diversity are all important. Language can be a barrier, so we want to ensure that officers can communicate well. North Delta officers work out of the public safety building on 84 Avenue. It is accessible to the public from 7:00 a.m. to 7:00 p.m. daily, so that people can come in with day-to-day concerns and deal with issues like criminal record checks. Dubord says the North Delta office does not see as much counter traffic as the main Delta Police building in Ladner, which he says is partly due to location. The North Delta community policing office is located at Scottsdale Mall, and the department is looking at it possibly moving to a standalone prominent location somewhere on or near Scott Road. The emphasis on building relationships has paid dividends in North Delta. In one case, a homeless person was taking refuge in an alcove along Scott Road. Police were called numerous times and a problem solving team involving addiction specialists and social workers analyzed what were the best steps to take. Support and help for him were arranged, and the calls ceased. A recent high-profile incident involving a distraught woman holding her probation officer hostage with a knife in North Delta also ended well, thanks largely to police efforts in relationship-building. Glynis Thurley, who suffers from mental illness, was well-known to Delta Police, who had many interactions with her before this incident. Thurley is facing two counts of assault with a weapon and one count of unlawful confinement. Melissa Granum, DPD’s corporate planning and communications manager, says Delta Police has more than 10,000 followers on Twitter and over 3,000 on Facebook. Social media not only gives police a chance to communicate directly with the public in an unfiltered way, it allows them to follow up on many leads. In one case, a young man dragged a couch onto an artificial turf field at Holly Park and set it on fire, damaging the field and forcing it to close for repairs. He took a photo of himself in the act of torching the couch – giving police the information via social media they needed to track him down and charge him. Residents of Stegavik Court in North Delta had some concerns about goings-on at or near their development. They set up a Facebook group, which Delta Police joined. This allowed police to monitor closely what was going on in the area and respond accordingly, eventually prompting a “thank you” from the residents. In a recent internal memo on the use of social media, Dubord told his staff that there were 32,000 interactions with the public via Facebook and Twitter from January through the first part of August – an average of 150 per day. Interestingly, the majority are positive or neutral interactions. There are far fewer negative reactions. “Through social media we have a better chance of shaping the conversation rather than letting the media shape it for us. We can get our message out fast and accurate,” Dubord writes.